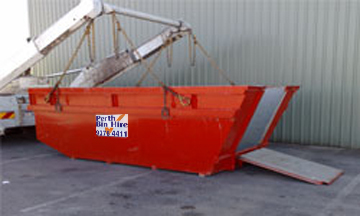 Are you looking for skip bins in Perth but don’t really know what type to get? Well, here at Perth Bin Hire, we’re experts when it comes to commercial and residential skip bins and Lift On Skip Bins are just one of the fantastic products we have in our rubbish skip hire repertoire. Here, we take you through everything you need to know when hiring a Lift On Skip Bin. What are Lift On Skip Bins? Our verge-friendly Lift On Skip Bins are a popular choice because they can be lifted into place, and have a ramp for easy wheelbarrow access. This means that you don’t have to worry about your driveway or grass getting scraped or ruined when the skip bin is delivered and picked up. The easy access ramp also makes loading your Lift On Skip Bin easier than ever, making it a good rubbish disposal option for landscapers, renovators, demolitionists and offices or businesses that are undergoing a big clean-up. The lift on mechanism also means we’re able to deliver more than one bin to your site at a time. Then, all you need to do is fill her up and we’ll take care of the rest! What Lift On Skip Bin Sizes are Available? Our Lift On Skip bin range is available in a number of sizes, starting with the compact two cubic metre mini-skips right up to the large and versatile ten cubic metre size. This size flexibility has made them a popular choice for both residential and commercial customers.